Antoinette Clark Wire is Robert S. Dollar Professor Emerita of New Testament Studies at San Francisco Theological Seminary and the Graduate Theological Union where she has taught since 1973. Dr. Wire is a graduate of Yale Divinity and Claremont Graduate School. Raised in China by missionary parents, she has lived her adult life largely in California. "Wire offers a fresh interpretation of Second Corinthians from a historically informed and rhetorically sophisticated feminist perspective. 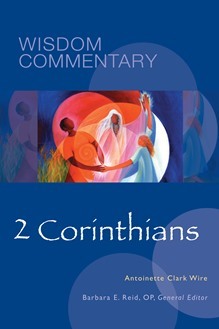 In continuation of the brilliant and influential work she has done in her previous book on First Corinthians, The Corinthian Women Prophets, Wire provides here a careful analysis on Paul's use of rhetoric in Second Corinthians to see what the new epistolary exigency is like behind Second Corinthians, especially, concerning the women in the Corinthian church and to understand how Paul responds to it. The result is a coherent narrative of Paul's message in Second Corinthians that is properly situated against the immediate and particular epistolary situation in the Corinthian church as well as the larger sociocultural and political background of the gender dynamic in the first-century Roman imperial world." "In Wire's analysis, what most concerns Paul is whether the Corinthian assembly, where evidently he is marginal `among a swirl of leading voices,' `can recognize Paul's beleaguered work as valid if he recognizes `the spirit of the living God' in them.' Maybe Paul should have found this a simple challenge. He didn't, and this new work, from one of the most innovative interpreters of Paul in her generation, lays out the contexts—philosophical, political, social, scriptural, and personal—and interactions that explain Paul's involved, ambivalent defense. A work in active dialogue with many facets of scholarship, church, and women's experience, its concise reasoning invites a close reading that paradoxically impels the reader forward in excitement."